Few realize that outgoing US president George W. Bush has left behind a unique legacy for future presidents, including Barack Obama — that they are all condemned to rank tops for a search on “miserable failure” in major search engines. It’s my hope that Bush will correct this before leaving office, or that Obama will fix it soon after he’s inaugurated. Below, more about the situation and how it could be solved. Google Kills Bush’s Miserable Failure Search & Other Google Bombs is my article from January 2007 that covers the history of how it came to be that for many years, a search for miserable failure on Google would bring up the official George W. Bush biography. This was due to a “Googlebomb” where many people had linked to his biography using those words in their links. Didn’t Google fix all that? And if it’s Bush’s biography, how does that impact other US presidents? Yes, the miserable failure “Googlebomb” was fixed at Google. However, should any future administration ever use either the words “miserable” or “failure” on the US president’s home page, there’s a good chance that page will start ranking tops again for searches like “failure” or “miserable” or even “miserable failure.” Using those words effectively overwrites Google’s “fix” for Googlebombs. 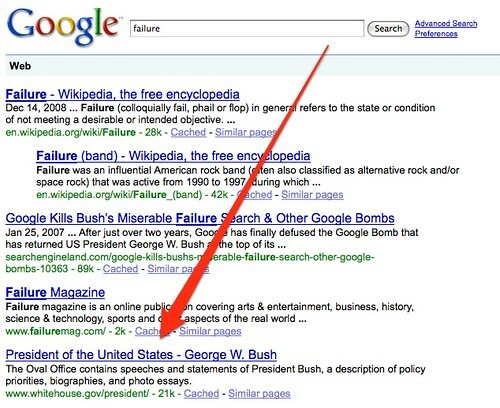 My George W. Bush: A Failure Once Again, According To Google article from April 2007 covers this in more detail and illustrates how Bush ended up back at the top of Google despite its Googlebomb solution. Meanwhile, the two other major search engines, Yahoo and Microsoft, continue to rank Bush tops. Fair to say, the problem isn’t gone. It remains a lurking threat at Google; it’s an active issue at Yahoo and Microsoft. But how does this impact future presidents? Isn’t this Bush’s biography we’re talking about? Yes, it is Bush’s biography. But in an inept attempt to defuse the Googlebomb, someone in Bush’s White House moved his biography to the page used by the current US president. That means when Bush goes, the next US president (Obama) inherits the problem. I think those behind this thought killing the old page would break the bomb. It might have, if they hadn’t redirected requests for the old page to a new location. Of course, they had to do a redirect. Too many people had bookmarked the former address of the biography. But rather than redirect to the new biography page, they choose to point at the page used by all US presidents — Bush currently, Obama next and future presidents to come. Aside from turning Bush’s search engine problem into a legacy issue for future presidents, the change is also misleading the US public and others. The redirection from the old bio page should lead to the new bio page, not require those using old bookmarks to guess at where the new location is at. I don’t understand why he hasn’t had this page all along. As I’ve covered, he did have a unique page originally that ended “gwbbio.html.” The generic “biography.html” page never existed before September 2006. In other words, there’s no long history of the current US president having their biography on a generic page that eventually will be used by other presidents. Instead, it’s entirely a creature that came out of trying to combat the Googlebomb. My recommendation — my hope — is this. It should point at the new page, as a “permanent” redirect. Technical note: stop using a fast meta refresh to do this. Google still seems to treat that as a 301 permanent redirect, while Microsoft and Yahoo seem to treat it as a 302 temporary redirect (see A Short Case Study on Redirects: 301s vs. 302s for more about the differences). Here’s hoping we’ll see some fast action. If you know someone in either administration, please spread the word. Google’s Googlebomb fix is supposed to prevent this from happening, as long as the word “failure” doesn’t appear on that page. I don’t see the word there, either currently or in the copy of the page that Google made as part of its search process. However it happened, it underscores why Bush should stop redirecting requests for his old biography to the current presidential home page. He leaves that page with a legacy of ranking for failure.